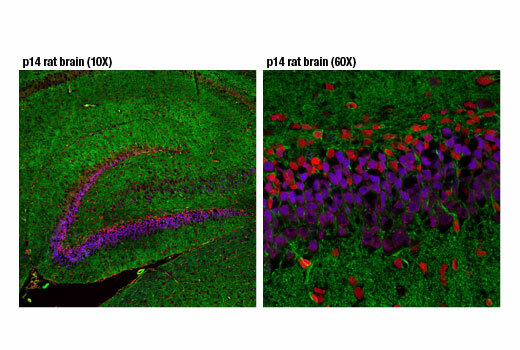 Confocal immunofluorescent analysis of p14 rat brain dentate gyrus using Phospho-CREB (Ser133) (87G3) Rabbit mAb (Alexa Fluor® 647 Conjugate) (blue pseudocolor). Actin filaments were labeled with Alexa Fluor® 488 Phalloidin #8878 (green). Red pseudocolor = Propidium Iodide (PI)/RNase Staining Solution #4087. Views shown are 10X magnification (left) and 60X magnification (right). 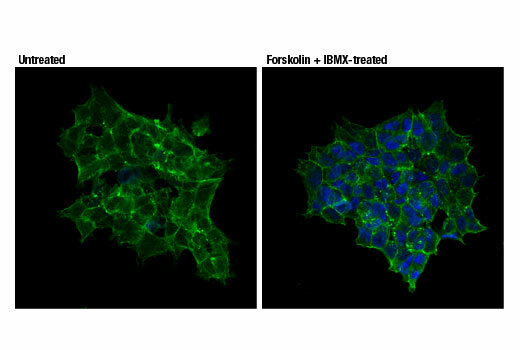 Confocal immunofluorescent analysis of SK-N-MC cells (serum-starved overnight), untreated (left) or treated with IBMX (0.5 mM) and Forskolin #3828 (30 μM, 30 min; right), using Phospho-CREB (Ser133) (87G3) Rabbit mAb (Alexa Fluor® 647 Conjugate) (blue pseudocolor). Actin filaments were labeled with Alexa Fluor® 488 Phalloidin #8878 (green). Flow cytometric analysis of serum-starved SK-N-MC cells, untreated (blue) or treated with IBMX (0.5 mM) and Forskolin #3828 (30 μM, 30 min; green), using Phospho-CREB (Ser133) (87G3) Rabbit mAb (Alexa Fluor® 647 Conjugate). 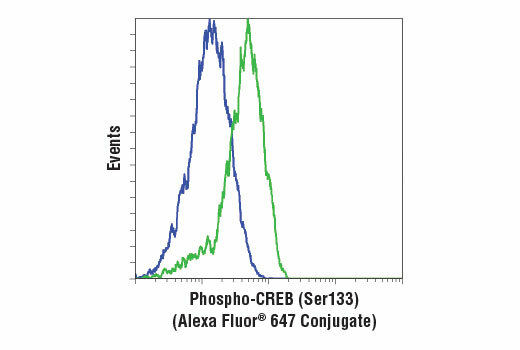 Phospho-CREB (Ser133) (87G3) Rabbit mAb (Alexa Fluor® 647 Conjugate) recognizes endogenous levels of CREB only when phosphorylated at Ser133. The antibody also recognizes the phosphorylated form of the CREB-related protein, ATF-1. Monoclonal antibody is produced by immunizing animals with a synthetic phosphopeptide corresponding to residues surrounding Ser133 of human CREB protein. This Cell Signaling Technology antibody is conjugated to Alexa Fluor® 647 fluorescent dye and tested in-house for direct flow cytometry analysis in human cells and immunofluorescence analysis in human cells and rat tissue. This antibody is expected to exhibit the same species cross-reactivity as the unconjugated Phospho-CREB (Ser133) (87G3) Rabbit mAb #9198.